I must tell you, I look forward to my weekends off. I can catch up on some stamping…and participate in Taylor’s cupcake challenges. For this weeks challenge, I kinda changed it up a little and added a more details than I should have. I wanted to use Stampin’ Up! products for my sample. The card base is Taken with Teal CS with a layer of Bali Breeze DSP. I corner rounded the two upper corners with my 3/16″ Corner Rounder Punch. The horizontal strip is Taken with Teal and Whisper White CS. Added some Pumpkin Pie Stripped Grosgrain Ribbon with a Pewter Brad. The sentiment is from SU! Many Happy Returns that I stamped in Purely Pomegranate ink on Whisper White CS and punched out with my Word Window Punch. Adhered to card base and added another Pewter Brad for balance. I had to punch and adhere each strip separately due to all the layers to create the circle openings (there are 5 layers of CS at this section of the card). So, I measured and punched the 3 circles with my 1-1/4″ Circle Punch. I created the Old Olive circle frames with my 1-1/4″ & 1-3/8″ Circle Punches. 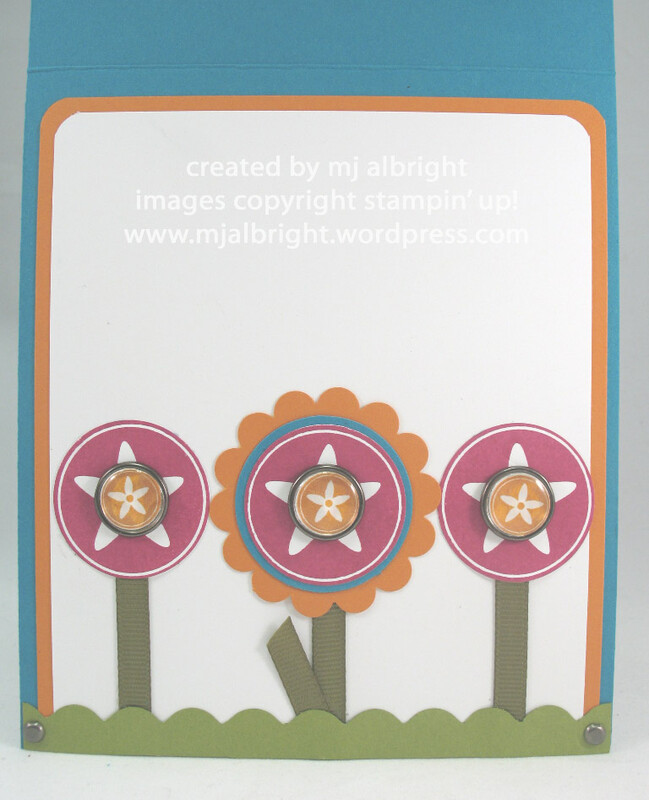 Now for those flower images within the punched circles….So you open up the card to reveal a bright arrangement of flowers:) So fun and a nice surprise! I first started with a piece of Pumpkin Pie and Whisper White CS that I rounded the two upper corners again to coordinate with the outside of the card. I stamped the 3 circular flower images from SU! Big Flowers stamp set in Purely Pomegranate ink on Whisper White CS. I punched them out using my 1-1/4″ Circle Punch. I then adhered strips of Always Artichocke 1/4″ Grosgrain Ribbon with the middle piece longer and folded up to create a leaf. The middle flower I layered on a 1-3/8″ Circle Punch piece of Taken with Teal CS and a Scallop Punch piece of Pumpkin Pie CS. Each flower has a Build-A-Brad in the center which holds a stamped image from SU! 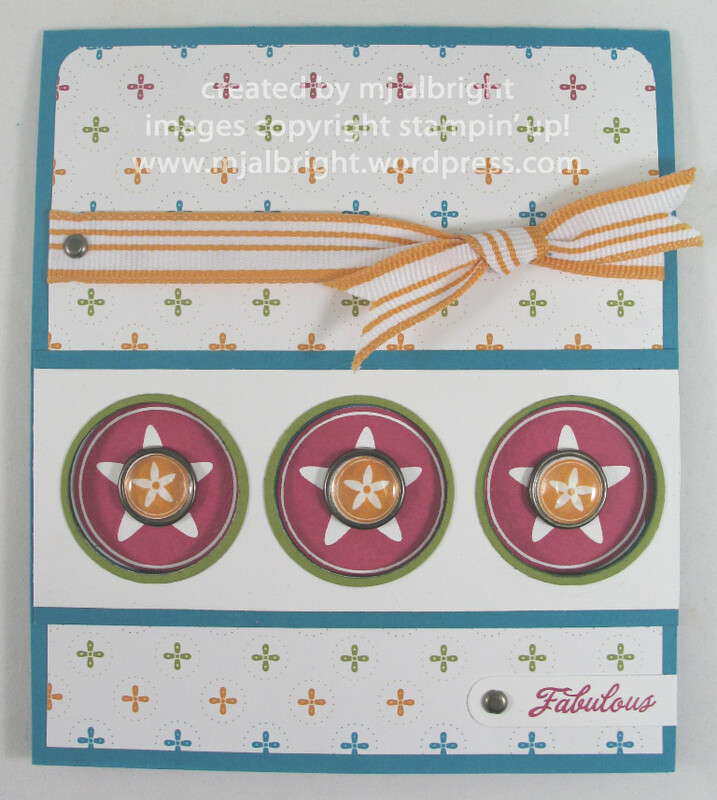 Little Flowers stamp set that I used Pumpkin Pie ink on Whisper White CS. Finally, I added a strip of Old Olive CS that I scalloped using my 3/16″ Corner Rounder Punch. I added a Pewter Brad to each end of the strip. Oh my gosh, this is so cute! What a great idea. I love how there is no clue there are flower inside, just pretty circles, until you open the card. A cute little “preview” idea. TFS! Oh how adorable, MJ!! I love the flowers inside… what a cute and clever idea. You rocked the sketch! Thanks for playing! This is awesome! I love the element of surprise with cards. Love it!! This is adorable! What a sweet surprise inside! You’re so stinkin’ clever! Amazing! Your attention to detail is second to none!